You really don’t need a concrete reason to get yourself a mini fridge. Students settling in their new dorm room, the office employees with long hours, the man cave captain trying to decorate their place, and the food enthusiast with a week’s worth of ingredients for their favorite meals, among other groups of people, have a reason to purchase a mini fridge. Mini refrigerators are a cost-effective, economical, and convenient way of keeping your beverages, leftovers, and condiments cool and fresh for long when you don’t enough space for a traditional-sized refrigerator. Obviously, they lack the premium features of their bigger cousins but as far as keeping your beverages and groceries refrigerated, they’re ideal. 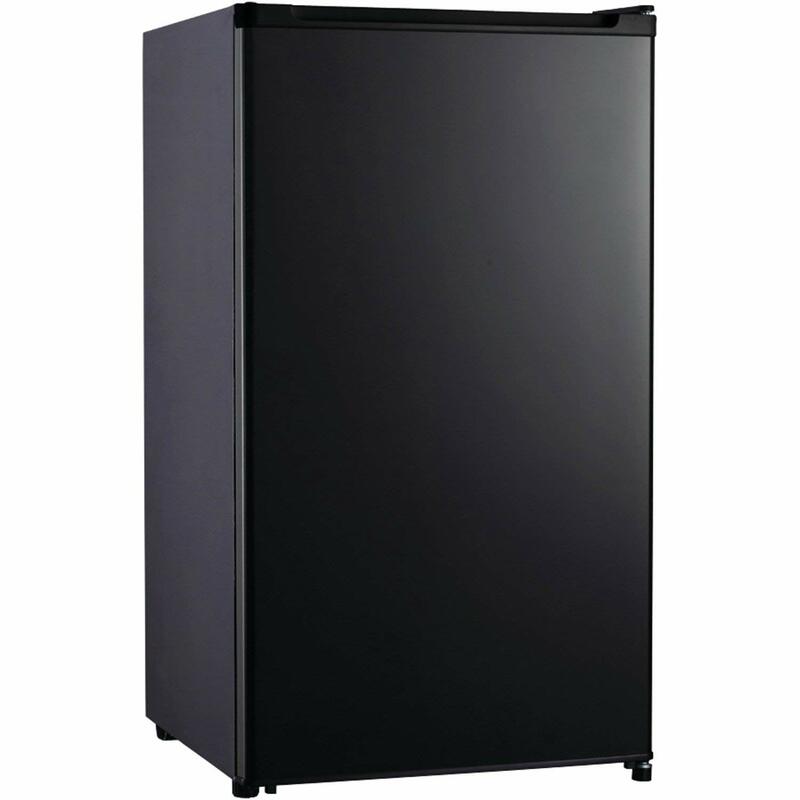 Patently, the market bursting at the seams with mini refrigerators of various models, sizes, and types, which can make it difficult to choose the most suitable model. To take the hard work and time out of the selection process, we’ve diligently put together a carefully curated list of 10 of the best mini refrigerators currently on the market. But first, it’s prudent to familiarize yourself with some of the essential features to look out for. 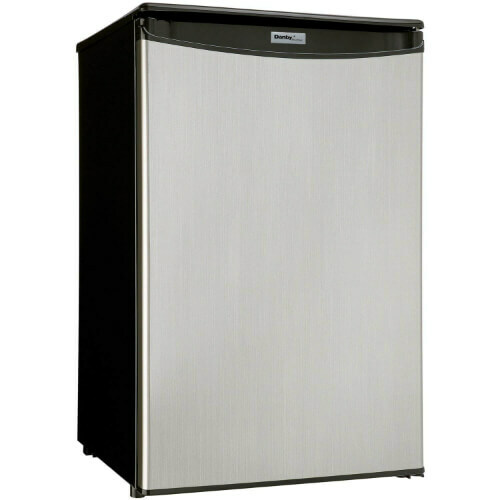 Danby DAR044A5BSLDD is a compact mini fridge that offers 4.4 cubic feet of interior capacity. It may sound really small but it provides more than enough room for storing beverages, your favorite munchies, and ingredients. As you would expect of any Danby fridge, this machine works flawlessly, quickly, quietly, and efficiently, minimizing your trips to the grocery store. 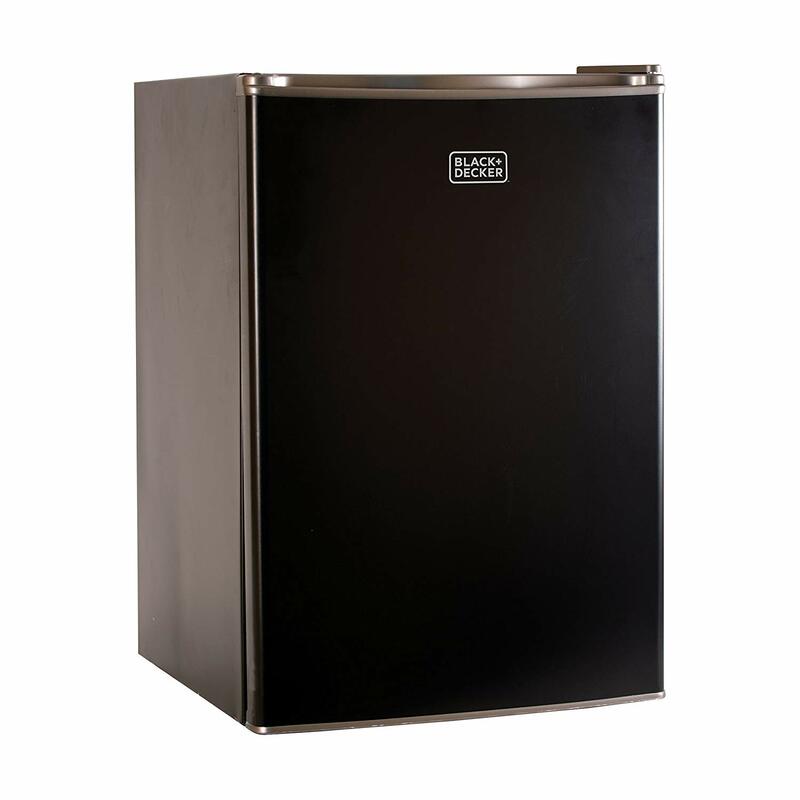 As for operational costs, the mini refrigerator is Energy Star compliant, meaning that it won’t dent your pockets like other models out there on the market. As mentioned above, it is professionally built to provide you and your family with 4.4 cubic feet of storage and cooling space. All yesterday’s leftover food, condiments and fruits go on the two and a half shelves. For additional storage versatility, it also features a see-through vegetable crisper with a glass top and a tall bottles rack for your favorite soft drinks. The fridge is also highly customizable, allowing you to store your favorite with ease. Thanks to the product’s Energy Star rating and the advanced mechanical thermostat, it is energy-efficient and therefore very economical to run. Further, the product comes with an automatic defrost system and spotless-steel finish that together take the time and effort away from cleaning and maintaining it. Opening and closing the door is a cinch because of the integrated door handle. It also incorporates a reasonably bright interior light for illuminating the fridge’s contents and because of the innovative reversible door hinge system, you can open the door from either the left or the right. And when it’s all said and done, you get a generous confidence-boosting and worry-free 18-month warranty. As the Danby enthusiastically points out, their DAR044A5BSLDD is made to suit your home and meet all your cooling and storage needs. It enhances organization and makes life easy. Midea WHS-65LB1 is yet another feature-rich product that does exactly what it promises to do. It offers 1.6 cubic feet of storage space, reversible door-left or right swing, and additional racks on the door, among several other impressive features. 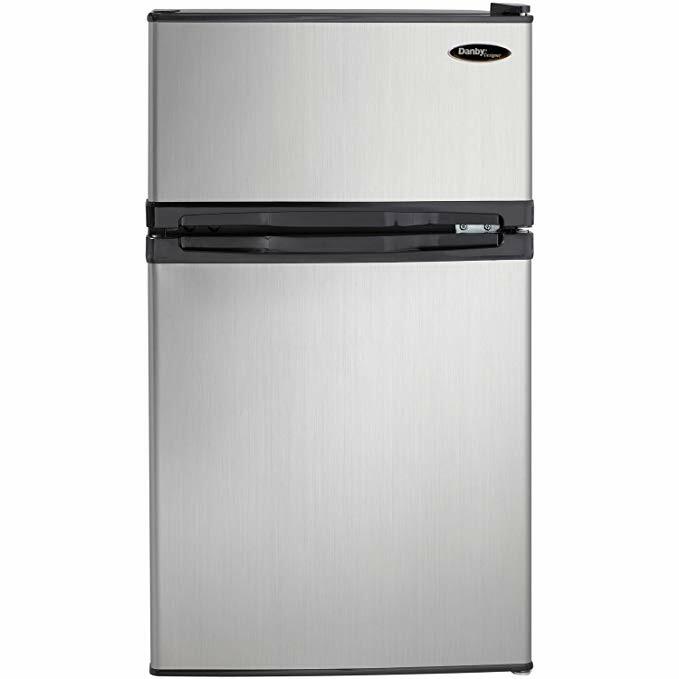 A poster child for exceptional quality, innovation, and reliability, the mini refrigerator offers great value for the money and would be an ideal choice for the value-conscious user. With a weight of 35.27 pounds and corresponding dimensions of 17.7 by 18.6 by 19.4 inches, it boasts a small footprint, making it a versatile choice for efficient use in a wide range of settings. In light of its physical dimensions and its free-standing design, it takes up the least floor space . And in light of its streamlined look, it easily compliments the décor of any space you put it. We can’t think of a place where you can’t use the Midea WHS-65LB1 if you’re within easy reach of a power outlet. Unlike cheap, run-of-the-mill models flooding the market, Midea WHS-65LB1 comes with whisper-quiet compressors that make it ideal for use in noise-sensitive environments. Coupled with the fact that it has a sturdy, scratch-resistant top, you use it as a bedside table while it quickly, efficiently, and uniforms cools your things. It allows for manual adjustment of temperature within a range of between 32' and 35.6' Fahrenheit for the seamless preservation of your food. It features spacious storage compartments and racks that can hold just about anything with the notable exception of frozen foods. It’s also not rated for making ice cubes. The legs adjust with lots of ease while the reversible door can be opened from the left or the right. It comes with a generous 12-month warranty. If you’re looking for a near-excellent option capable of quickly, efficiently, and evenly cooling food and beverages, look no further than Midea WHS-65LB1. With the Igloo selling at a reasonable and justifiable price, you finally have a concrete reason to keep food and beverages within an arm's reach from the bed. A versatile storage capacity of up to 3.2 cubic feet should be more than enough for most of your beverages, fruits, leftover food, and other foodstuffs. It's far from boring on looks. External aesthetics provide for effortless blending with your interior décor. Several features and specs make it tick with the vast majority of homeowners all over the world. The two most outstanding of these features are the freezer and the compressor cooling. The features translate to quick and efficient cooling of a wide range of foodstuff and beverages. Unlike other models that don’t have a freezer, you can also make ice cubes with the mini refrigerator. The 3.2 cubic feet refrigerator also features an adjustable thermostat for maintaining the interior temperature at a pre-set level, which you’re of course at liberty to adjust to match your cooling needs. Aside from the thermostat, the product's shelves are similarly adjustable. And, it features a large storage rack on the door that securely and comfortably holds a 2-litre bottle of your favourite drink or beverage. 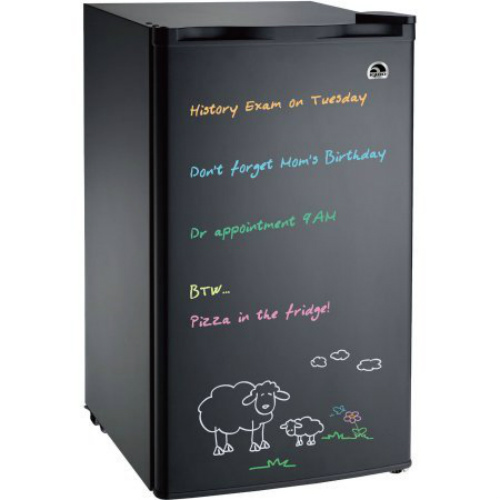 The main highlight is that you can write and erase notes on the refrigerator's door, which eliminates the need to stick yellow notes on it. It has dimensions of 20 by 18.2 by 33.2 inches and is relatively lightweight for hassle-free portability. You'll also appreciate how quietly it runs, even in the dead of the night. The likelihood of its startling a sleeping baby is very remote at best, which also explains why it’s an all-time favorite of homeowners. For the homeowners searching for a powerful, quiet, lightweight and cost-effective option, the Igloo should be up your alley. You’ll never look back. This product is a feature-rich alternative that packs all the essential features and pulls all the stops to provide its users with the ultimate cooling experience. Some of the unique selling points include reversible doors, freezer, easy and quick installation, automatic defrost, Energy Star certification, customizable shelves, and a molded worktop. Admittedly, it’s a little expensive but considering that it provides you with the best of all worlds, it’s worth every penny. With features and attendant performance that rival full-sized fridges, the EdgeStar CRF321SS is the closest you’re going to get to perfection without breaking the bank. Like a handful of other top-notch options, the product comes with a freezer that’s intelligently placed to offer incredible storage versatility. And the machine is a high-performance option that effortlessly and quickly freezes foods down to 0 °F, keeping them cool and preserving their freshness much longer than other standard models. The unit qualifies as a mini item by sporting a lightweight and compact design. It weighs a reasonable but a tad heavy 52 pounds while its height, width, and depth stand at 33-1/2, 18-3/4, and 19-3/4 inches, respectively. It fits easily and comfortably in small spaces such as dorm rooms, under countertops, desktops, and other confined spaces without taking up too much floor space. You can bring your favorite munchies and lunch to the office knowing it'll stay cold and fresh the entire time. The unit offers you a wide operational temperature range of between 34 and 60 °F, easily adjustable with the user-friendly temperature control. Another signature feature is the auto defrost that coupled with the adjustable wire and glass shelf, vegetable crisper, and in-door storage, takes the time and effort away from storing and cooling various foodstuff and beverages. Additional standout features include the interior lighting, energy star certification, and 90-day warranty. Together, these features make it one of the best mini refrigerators currently on the market. This is a compact choice with a storage capacity of 3.2 cubic feet and coupled with its lightweight design, it fits snugly into the smallest of spaces, including and especially below the work desk and beside the bed. It's cost-effective and durable and works powerfully and flawlessly which is surprising for such a small machine. As the name suggests, it is a no-frills choice that comes with only the most essential features, which also explains the absence of a freezer. It’s built specifically for cooling and preserving the freshness of your drinks, leftover food, favorite munchies, and groceries. If your main fridge is fast running out of space, this model would make for a superior addition. And of course, it comes with plenty of space. These include 2 removable glass shelves, a crisper drawer with a cover, and a 12-oz. beverage can dispenser. They'll help you keep everything in its place and neatly organized so you can quickly and easily reach what you want. To help with this, it also boasts interior bright lighting. To give you even more space and storage versatility, the product has a reversible door and features flush back design. You can adjust the glass shelves to suit your unique storage needs, which also makes it a cinch to clean when it gets dirty. As is the case with most options, Magic Chef MCAR320B2, meaning that it costs a pittance to run. And it’s a cinch to use, thanks to the incorporation of a user-friendly temperature control dial. In all, it is an unbeatable deal, especially for value-conscious users working on a budget. It may lack a freezer but it compensates for that that providing you with lots of storage room. As far as practicality and functionality go, the Cooluli Cooler and Warmer are hands down one of the best options on the market. Only a handful of products on the market can blend an ingenious design, professional shelving system, affordability, and energy-efficiency like this model does. On the off-chance that our first 5 picks don’t cut it for you, this should be an ideal choice considering that it has a slew of virtues that puts its performance at par with a few high-end picks. Among other things, it offers plenty of space for keeping all your favorite drinks and has a versatile thermoelectric system that switches with ease from heating to cooling. In spite of deceptive small profile, the product boasts an impressive storage capacity and in light of the innovative shelving system, it easily and comfortably accommodates a wide range of products. You can easily store variously sized bottles, cans, and even yesterday’s leftover food. Preserving ingredients for a favorite recipe or meal is made easy with a cooling capacity of between 40ºF-45ºF below ambient temperature. Plus, the temperature settings are highly customizable to meet the user’s cooling preferences. The mini refrigerator has dimensions of 11 by 7-1/4 by 10 inches and a 4.8-pound weight that pairs nicely with its sleek and long-lasting design to offer the user incredible versatility. Its sleek and contemporary design, together with the matte finish easily complements its environment, allowing for seamless blending in with the office or house décor. Other features that contribute to its portability include the robust polypropylene plastic design and magnetic self-lock latching door and the provided DC adapter. It also doubles up as a food warmer, making it an ideal outdoor companion. The Cooluli is a solid choice for a wide range of settings including the office and home. It can comfortably hold 6 12 ounce cans and sports a fast-working thermoelectric cooling system for the best performance. Our 7th pick is the stylish and simple Danby DAR033A6BSLDB. And it comes packed to the brim with a litany of features right from the outside to the inside to help keep your drinks, fruits, and foodstuff fresh. Plus, in spite of its 3.30 cubic feet capacity, its ingenious design provides plenty of space for storage versatility. And it’s irresistibly contemporary looking so that it seamlessly matches the décor of your room or kitchen without being the focal point. It offers a storage capacity of 3.30 cubic feet, enough for keeping all the foodstuffs that you can’t risk going stale. It comes with two and a half tempered glass shelves, offering the user incredible storage versatility for keeping a wide range of things. The door integrates a heavy-duty shelf with a compartment for storing tall bottles that’s perfect for holding soft drinks. As is the case with the vast majority of options, this model also comes with a bright interior LED light for illuminating the contents, allowing for easy and quick identification. Unlike most LED lightings though, this one doesn’t raise the temperature within the fridge. Just like the interior, the exterior of the Danby DAR033A6BSLDB is of impeccable quality. It features the brand's patented retro-inspired curved door design that closes perfectly, ensuring an air-tight seal. The machine extends its combination of contemporary form and classic elements to its door, giving it a spotless finish. Together with the fact that it's made from steel, the door doesn't bend or suffer dents easily. Another highlight is the ease of opening and closing the door, thanks to the incorporation of a rubber-grip ergonomic handle. Further, it is Energy Star compliant and boasts an R600a refrigerant. It also has an automatic defrost feature and reversible door hinge. With a weight of 60 pounds and dimensions of 20.4 by 17.7 by 33.1 inches, it’s both lightweight and compact and conveniently features a scratch-resistant worktop. Simple and stylish, it deservedly earns its place in the modern home. Boasting several innovative features and a stylish design, it packs all the features you need. That Black & Decker is an industry stalwart is not disputable. Their leading producte, the Black & Decker BCRK25B, comes with all the hall features and specs of a high-end machine. If you’re tired to waking up to stale leftovers, maybe it’s high time you considered investing in this workhorse option. With plenty of space on the racks and shelves, you can easily keep all your favorite snacks and drinks within an arm’s reach, saving you the time and effort of leaving the comfort of your bed on weekends. Further, it’s reasonably and justifiably priced and since it’s energy-efficient it doesn’t use as much electricity as cheap, off-brand models. The machine's 2.5 cubic feet capacity isn't comparable to that of other competing models'. Still, it provides enough space for storing a decent amount of food and beverages. For instance, it has two full-width glass shelves and two full-width door shelves capable of accommodating two-litre tall bottles. The icing on the cake though is the fact that it features a full-width freezer compartment with a durable ice cube tray. Further, it has an adjustable thermostat control for customizing your cooling needs. 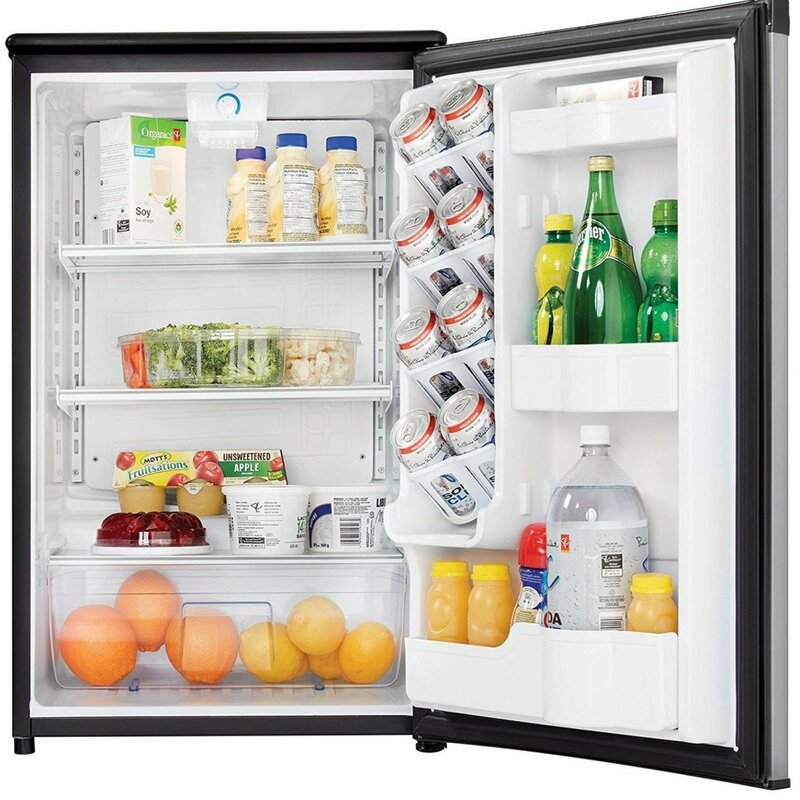 The bottom line is that the Black & Decker BCRK25B Compact Refrigerator has several performance features to help keep your drink cool all day long, and you don’t have to lift a finger. Like our previous choice, running it is cheap since its Energy Star certified. And since it's lightweight and compact, it's highly portable and fits with ease into small and confined spaces. Further, because it has a scratch-resistant top, which can double up as a place for keeping additional items. For instance, it can function as a bedside table. Don't worry about is keeping you up all night because the machine is ultra-quiet. To these features add the reversible door that you can install to open to the right or the left. 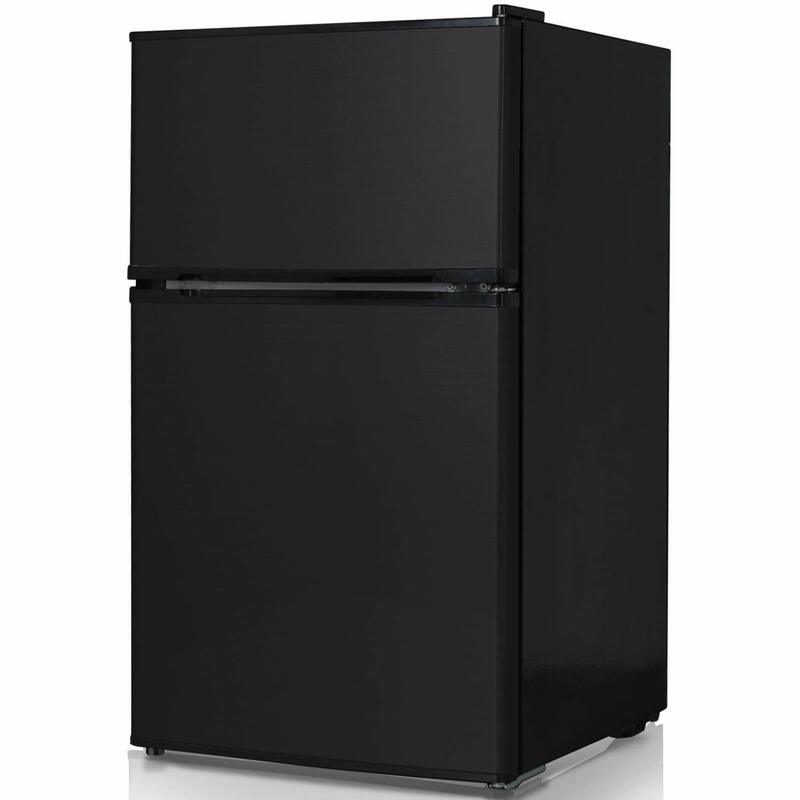 A litany of features and a 12-month warranty make it one of the best mini refrigerators on the market. It’ll never disappoint. The Keystone KSTRC312CB ticks all the right boxes and packs a punch. It comes with separate refrigerator and freezer both of which offer decent room for storing several things. It has a storage capacity of 3.1 cubic feet, enough to hold two weeks’ worth of food. It’s also aesthetically pleasing and a perfect choice for small spaces such as dorm rooms, small offices, and even bedrooms. The interior features 2 glass shelves and a vegetable crisper drawer with enough space for your leftover food. You can keep the ingredients for your favorite recipes, condiments, leftover food, and other foodstuffs on the two shelves. If you're anything like us, you'll also be worn over by the additional built-in door storage that can hold canned beverages and a 2-litre bottle. Further, it comes with a small-item rack, which, according to the manufacturer is “perfect for storing single-serve yogurt”. And that’s just a tip of the iceberg. On its laundry list of features, the product also sports a standalone top-mount freezer with manual defrost and additional storage on the freezer door. Expectedly, the fridge’s doors are reversible for effortless opening and closing. The product similarly comes with adjustable legs to enhance stability on different terrains and it’s a cinch to use, thanks to the simplicity of its design. It’s also lightweight and relatively compact and fits easily in small spaces, making it an ideal choice for use in confined spaces. And because it runs smoothly and quietly, the likelihood of it startling you from sleep is minimal. Its slew of features makes this an ideal choice for use in any room or space. It’s powerful, runs smoothly and quietly and has plenty of room for keeping your food. 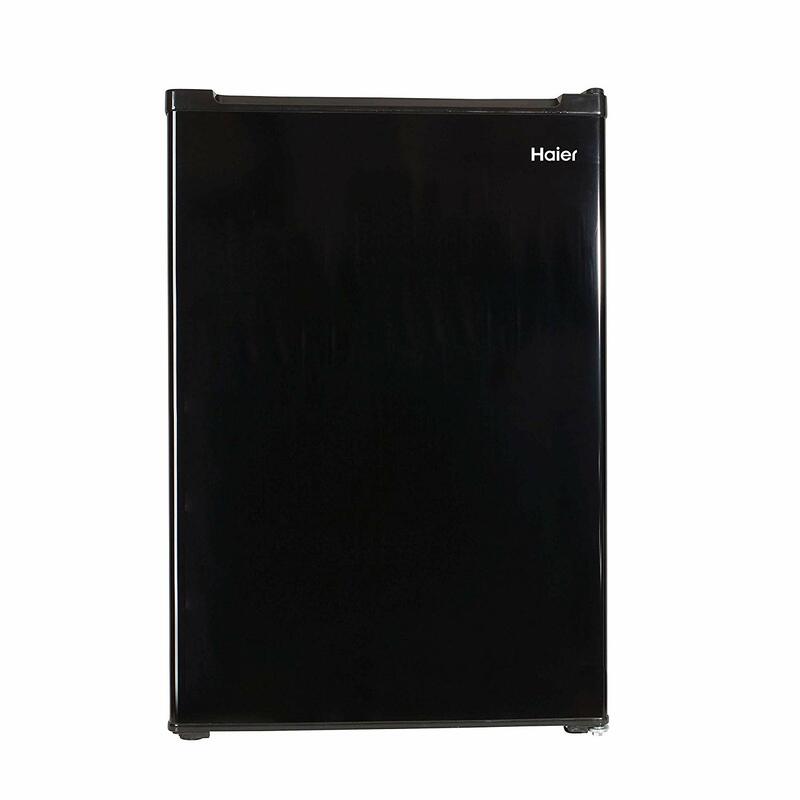 Rounding up our list of the 10 best options currently on the market is this high-performance, functional, and cost-effective Haier 3.3 cu. ft. fridge. It comes with a roomy interior for storing an array of foodstuffs and beverages, keeping them cool and always ready for use in a moment’s notice. Its high points include an innovative shelving system, budget-friendliness, and efficient performance. And it’s very versatile and energy-efficient for such a small product. The product provides you with a reasonable 3.3 cubic feet of storage capacity, enough to complement your main fridge if you’re running out of space to meet the food cooling needs of your growing family. The door is capable of accommodating bottles and cans of various sizes thanks to the incorporation of two full shelves, 2 half shelves, and a compartment for a two-litre bottle. There are additional shelves in the interior for all your foods, vegetables, and bottles. 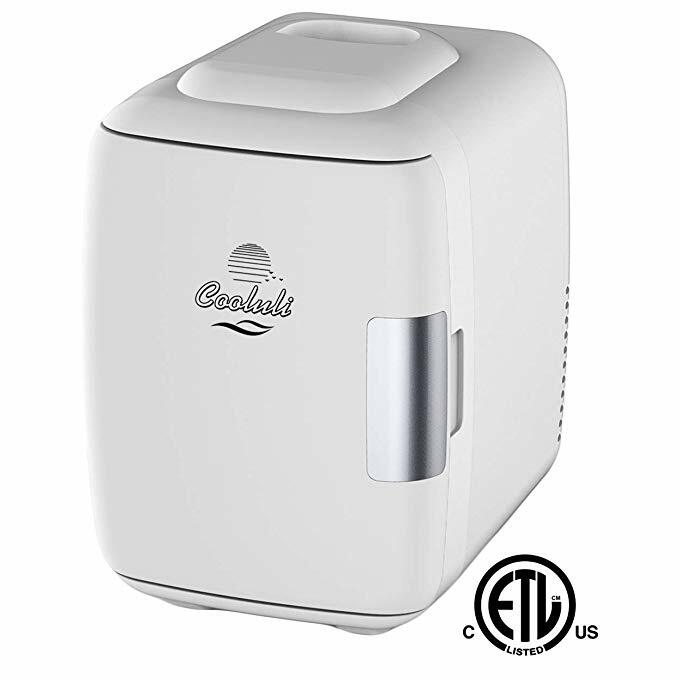 Unlike cheap, off-brand models, the product has a powerful mini-freezer with an ice cube tray so you always have ice cubes whenever you need them. Adjusting the temperature to meet your needs is both easy and quick. 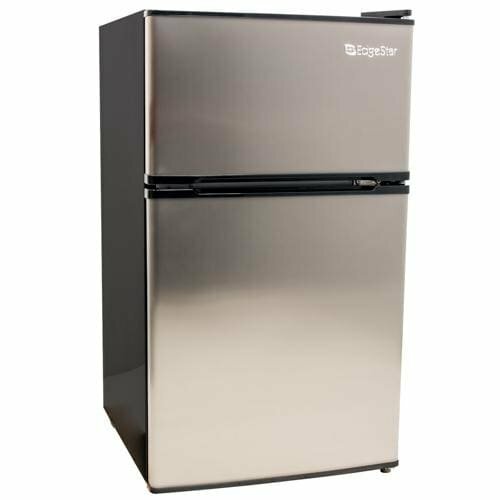 Reversible doors are another staple for mini fridges and this one is no different. The hinges are removable and transferable from one side to another. Armed with a simple screwdriver, transferring doors is both quick and straightforward, allowing you to customize it to suit your needs. Additionally, because of its lightweight and compact design, it fits with remarkable ease in confined spaces such as below the work desk, the trunk of a car, countertop or beside your bed. Ensure though that you leave enough to encourage free airflow. While it is competitively priced and runs efficiently and economically, it nonetheless lacks n interior light. Therefore, it may not be an ideal choice for people planning to use it in areas that aren’t properly lit. Also, it lacks an auto defrost feature. However, compared to the value it offers, these drawbacks aren’t a deal breaker, at least not in our opinion. Still, for those looking for a cost-effective, high-performance, durable, and smooth working mini refrigerator, take another serious look at this workhorse. 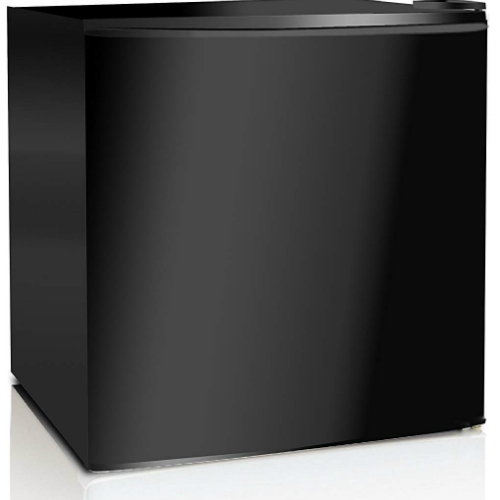 Mini fridges come in handy when there are space constraints at the office, kitchen, dorm, or bedroom. And they vary vastly in size. The smallest offer a storage capacity of approximately 18-inch cube while the biggest hover somewhere around 4.5 cubic feet. Thoroughly analysing your food and beverage consumption habits should give you a pretty good idea on the most suitable size. The mini refrigerator should be roomy enough to hold more of your leftovers, beverages and condiments yet small enough so it fits snugly in confined spaces. Keep in mind though that bigger models are more adept at maintaining a specific temperature and offer superior energy efficiency. Another paramount consideration is the price of the mini refrigerator. As a rule of thumb, costly models packs infinitely more features than their cheap counterparts. They perform better, are generally quieter, are roomier, and despite the high initial cost of acquisition, they offer superior long-term value. This doesn’t mean you should dig deeper into your pockets to get features you don’t need or will ever use. Keep in reasonable. Reversible doors allow you to open the door from either the left or the right and the design aims at suiting both left- and right-handed people. Also, look out for adjustable shelves. They provide for exceptional customization and take the time and effort away from cleaning the interior when it accumulates dirt and debris. A freezer is a nice addition especially when you need ice cubes. However, they take up space that would otherwise be used for refrigeration. Quiet models can be confidently used by light sleepers compared to loud ones. Also, consider going for a model with dedicated compartments for various items such as tall beverage bottles and smaller can as they help with overall organization, and help conserve space. Lastly, look out for an interior lighting. Not all models have one. Q: How loud are mini gfridges? A: That depends from one model to another. The decibel should be indicative of this. Confirm with the brand before purchasing if you need? a quiet one. Q: How do I properly care for my mini refrigerator? A: Again this varies from brand to brand. Generally though, regularly cleaning every other week, getting rid of spoilt foods, and avoiding spillage should do the trick. For the student, homeowner, or worker looking for a way to keep their leftovers, munches, ingredients for favorite recipes, or beverages cold and fresh, a mini refrigerator is must-have. Compared to their full-sized counterparts, they’re more affordable, lightweight, compact, and fit with ease in small spaces. We present to you the best models the market has to offer. Provided you keep in mind the few considerations we spelt out earlier, finding a most suitable model should be a walk in the park.